"egg carton" and all of her other creations! And this is my little pink box. Bright, bright pink - not really my color. But this little box had so much going for it and I saw the result in my mind before I even started! And this is what my little box looks like now!! 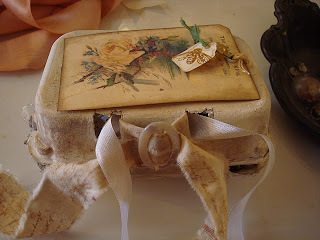 I painted the outside with a pale cream color, much more me and used bits of old lace, buttons and pearls to embellish it. A little tag gave it the last touch. But the best is still to come ... the inside! I turned this little thing into a gorgeous sewing box! Filled with everything you would need ~ old lace rolled onto vintage clothes pegs, a spool of old thread and that's only some of the goodies in this little treasure box. I decoupaged the entire inside if the box with pieces of old sewing patterns and using a scrap of tea stained muslin, a little crochet something, a few old buttons and scrabble pieces the transformation of the inner lid was completed. It also holds pair of tiny vintage scissors, a wee old thimble, and some old buttons threaded together so you can't loose them. A little glass bottle holds the sewing needles. I hope you like this transformation as much as I do. Let me know what you think! WOW! Very impressive and inspiring transformation. LOVE LOVE LOVE Every Detail!! Karen, It is FABULOUS! I love it all! Great idea-thanks so much for sharing. I'm going to have to make one for me! And you know what? Those are my initials! Isn't that funny? lol! You are so talented my friend. Your sewing box is beautiful! I love how you transformed the out side, but the inside is fantastic! I think a quiche will be made this weekend, just so I can use the carton. Thanks for the inspiration! Have a wonderful weeekend. It is a most wonderfull transformation- ---BEAUTIFULL----- and I love the inside filled to the brim,with all your lovely old bits and pieces- what a fantastic work of atr. That is the CUTEST box!!! You have a great eye and one of the most creative minds ever! Thanks for sharing that with us!!! Sew creative! I love it! Oh, Karen, what a work of art! All of the little details are amazing! There's so much to look at! I've never tried egg cartons because of their "bumpy" surface. Obviously, you didn't allow the rough surface to get in your way and the results are beautiful! Again, I'm so glad I found your blog. I love looking at your creations! What an incredible transformation! And all those beautiful little bits and pieces you have filled the gorgeous box with, I can only drool over the pictures. Next egg carton I get is so gonna be transformed. Thank you so much for the inspiration. I saw it , loved it and made one,a 6 pack. Now i am making a second one, a "round"egg carton, a 7 pack. Thinking what i can make out of it...but i will! As a qulter I have fallen in love with your sewing box. It is to die for. I hope that I can find a small unique box. Thanks for sharing. What a lovely transformation. I featured it at <a href="http://storagegeek.tumblr.com/post/24858444830/from-a-hot-pink-egg-carton-to-shabby-chic-sewing>The Storage Geek</a>. Thanks for sharing!